For the eighth year in a row, litigation support and document management company CommonSource donated food, clothes and personal items for local families in need. Employees gathered earlier this month to collect and wrap gifts including warm clothing and three to four days' worth of food. The donation was made as part of a program run by Christ the Good Shepherd Catholic Church in Spring, Texas, where CEO Ann Zdansky and chief operations officer Shannon Reed are members. Each year, members from Christ the Good Shepherd are invited to adopt families from Holy Name Catholic Church, a sister parish located in downtown Houston. This year, CommonSource adopted five families — a total of 35 people ranging in age from two to 66 years old. "Giving back is an important tradition at CommonSource," Zdansky said. "We are proud to support this and other charitable causes throughout the year and around the world." 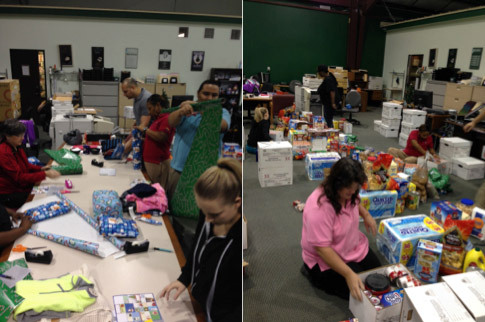 CommonSource Cutline: Staff at CommonSource sort and wrap gifts for local families in need.